Book 6 of 100 on the Great American Read list. 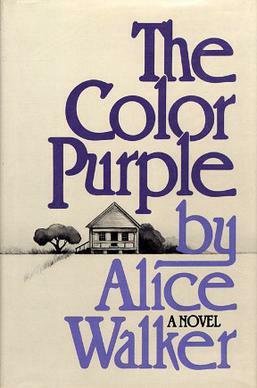 I read The Color Purple at University in the UK for a feminist literature class. And I am ashamed to report that I didn’t remember much about it. Rather like Squeak I did smoke a lot of reefer at the time, so maybe that’s why. It’s more likely that I just lacked the context to be able to read it deeply. After ten years in America, I have a slightly better idea of the context for The Color Purple. I've read more black authors, learned more black history, listened to black activists and I’m trying to see a big picture. The picture is huge. As big as the world. I doubt I’ll ever see all of it because I'm not black and I’m not American. So bearing in mind that my understanding of the context is still imperfect, here’s what I thought this time I read The Color Purple. Never in the history of anything has a book that begins with the sexual abuse of a child contained so much joy and life. The Color Purple is told through the prayers and letters of Celie and her sister Nettie. The two girls grow up together in the South in the 1930s, Celie stays in Georgia, while Nettie becomes a missionary in Africa. Mostly, the plot rests with Celie, we only hear from Nettie when Celie gets access to her letters. And Celie's life is hard. Raped by her supposed father, her children are taken from her and then she's worked relentlessly by an abusive husband who's name she doesn't even know. It's a disturbing story. But then her husband brings home an old flame, the jazz singer Shug Avery and Celie's relationship with this dazzling woman restores her humanity and her faith in god. Eventually, Celie turns on the abusive husband, becomes a successful business woman and is reunited with her sister and children. And when she does, it is incredibly cathartic. Why is it on the list? Because reading it is an affirmation of being alive. Because there should always be stories about black lesbian feminists on school reading lists. And because it’s an incredible work of historical fiction. Alice Walker crams a lot of African American history into The Color Purple. It's sometimes hard to remember that it was written as late as the 1980s. In the West African letters Nettie is amazed to discover the history of the African Kingdoms. She also sees white colonization with her own eyes when the rubber road arrives to destroy the Olinka village. Meanwhile in Celie's letters, her friend Sofia experiences something similar to being a house slave, even though the book is set post-slavery. There’s also the history of the influence of black culture on America in the juke joint, Shug Avery’s rise to fame and fortune and black female entrepreneurship. Religion, hair, sexuality, lynching, language, toxic masculinity, colorism, incarceration, mental health and communal child rearing are also here, along with probably much more that I’m missing because I’m still learning. The Color Purple feeds and enriches American culture. The book won the Pulitzer Prize for Fiction in 1983 and was made into a movie in 1985. The movie was nominated for 11 Oscars (although it didn't win any of them). The film launched the career of Whoopi Goldberg and truly established Oprah Winfrey as a force to be reckoned with. I see references to The Color Purple in Beyonce's Lemonade. On the flip side The Color Purple ranks high on the ALA list of 100 most banned or challenged books. I can’t think of a better book to help me understand America.